Neur al Engineering Labor at ory is dedicated to solve problems in growing live neurons on a chip. We are interested in understanding and controlling in vitro neural interfaces. The knowledge gained will be translated to solve neural interface problems, for basic neuroscience research, drug testing, and eventually for application to neural prosthetic devices for human. A visionary question that we use to guide the research is “Can we build a biological neural networks in a dish?”. Success in this endeavor implies that we can interface neural networks reliably with a readout platform (e.g. microelectrode arrays), design neural networks by controlling individual neurons (e.g. 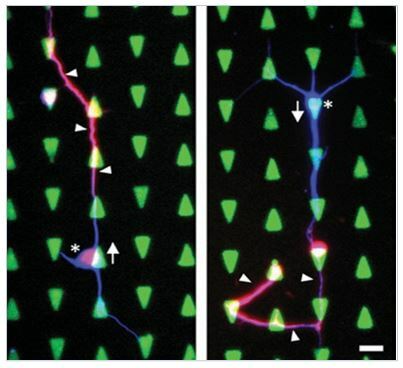 axonal growth), and stimulate neural networks to control network functions (e.g. excitation or inhibition). Our research goal is to establish a set of enabling technologies that we name ‘Neuron-on- a-Chip technology’. ‘Brain-on-a-Chip’ is the name given to the related and emerging multidisciplinary field that is revolutionizing how neuroscientists study structure and function of neural circuits. The essence of the Brain-on-a-Chip is to obtain functional brain models and interface them to read neural signals and deliver various stimuli to the model. My Neuron-on-a-Chip technology could provide important breakthrough in this new field. Eventually, we will be able to engineer a brain model that would serve for both understanding brain functions and treating brain disorders. microelectrodes and nano-grain microelectrodes . Recently, we developed a plantinum-black MEAs with improved mechanical stability using polydopamine-platinum black nanocomposite structures . The basic understanding of neuronal gro wth on artificial nano/ microenvironments is important for Brain-on-a-Chip technology. We are interested in discovering new physical and chemical guidance cues that lead to axon guidance and directed neuronal growth. We study neuronal development and growth in defined surface chemical cues or topographical cues. We have been investigating neuronal growth on surface-bound micropatterns (micropolygons , micro-dot arrays [4, 5], micro-stripes [6, 7]) nano-topographical substrates (nanobeads, anodized alunimium oxides, silicon nanowires ). 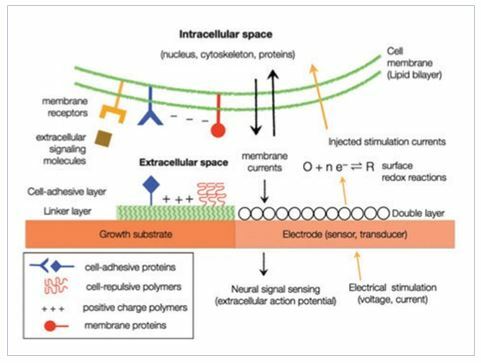 In order to grow neurons in vitro, we design the cell-surface interface using chemical functionalization approaches. In addition, we are actively searching for a simple and effective cell-adhesive or -repellent substrates. We also developed an agarose hydrogel patterning method using a micro-molding in capillary technique to design ordered neuronal networks on microelectrode arrays. We have pioneered in using a mussel-inspired polymer coating (‘polydopamine’) in MEA for covalently linking cell-adhesive biomolecules on metal and insulator through dip-coating  or electrochemical deposition . We use nano-transducers (e.g. 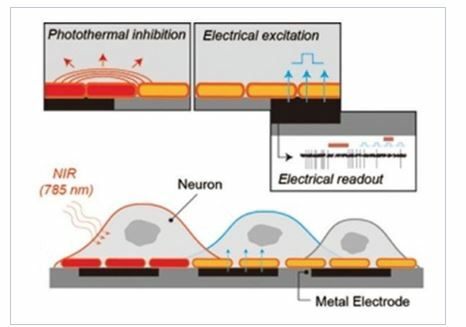 gold nanorods) to design neuro-photonic interfaces for controlling neural spiking activity. We showed, for the first time, that photothermal conversion induces reversible inhibition of spiking activity for more than tens of minutes. We showed that the inhibition occurred at the single cell and single action potential levels, and that the mechanism for the inhibition was through the temperature-sensitive potassium channel, TREK-1, which operates at elevated temperature range. 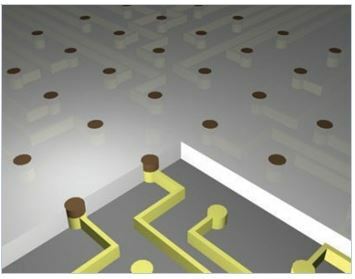 We also came up with an electro-optical MEA platform that integrated gold nanorods with a microelectrode array. Compared to optogenetic stimulation methods, our method does not require genetic modification giving it strong advantages for potential clinical applications. We hope to extend this new inhibition method to the treatment of abnormal brain diseases such as epilepsy by regulating hyperactive neural activity. 8. 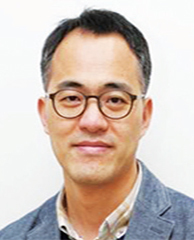 Kang, K, Choi, IS, Nam, Y, "A biofunctionalization scheme for neural interfaces using polydopamine polymer," Biomaterials, vol. 32, pp. 6374-80 (2011). 1. 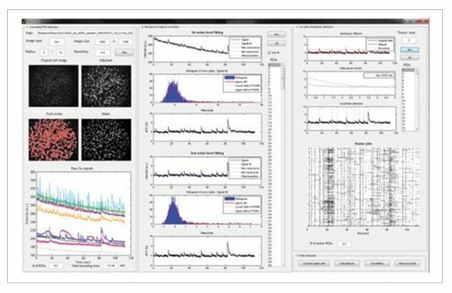 Hong, N, Joo S, Nam, Y, “"Characterization of axonal spikes in cultured neuronal networks using microelectrode arrays and micro channel devices”, IEEE Trans. Biomed Eng, vol. 64, no. 2, pp. 492 – 98 (2017).